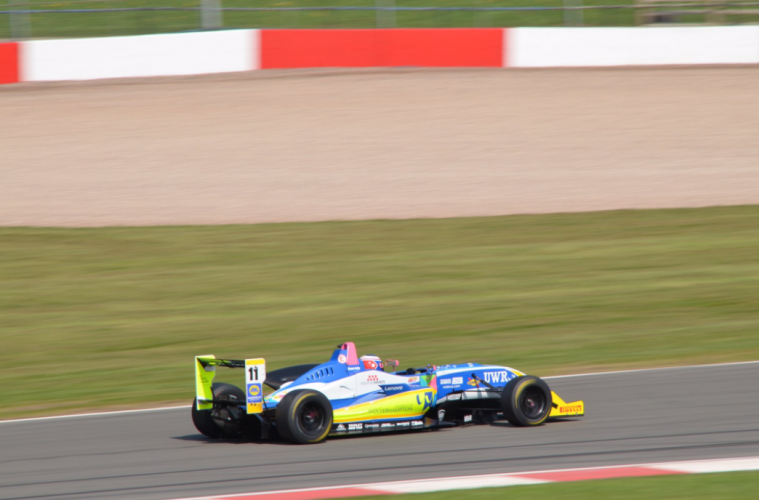 University of Wolverhampton Racing (UWR) got off to a flying start in the 2018 F3 Cup, finishing on the podium in all three races of the opening weekend at Donington Park. The team, made up of engineering students from the university, has taken second place in the cup for the last two seasons. As well as being the only university team that participates in F3, UWR also competes in Formula Student, the British Hillclimb Championship and the AR Morgan Challenge. Driver Shane Kelly, a 37-year-old experienced professional, acts as mentor for the team alongside his F3 race duties. Something of a Donington specialist, Kelly took first place in the final race of three over the weekend, taking him to the top of the driver’s table. For the past two seasons, Kelly completed a clean sweep of the Donington Park races on the opening weekend. Earlier in the week, the university’s £10m Telford Innovation Campus served as the backdrop for the launch of the 2018 car. While engineering students form the backbone of the team, students from across the university help to test, prepare and race the cars, acquiring the skills required to forge a future in the world of motorsport. Professor Ian Oakes, Deputy Vice-Chancellor at the University of Wolverhampton and Chairman of the UWR race team said: “The significant investment we have made in engineering on the campus has provided us with facilities which are amongst the best in the country combined with a really attractive course offering for students who want to study engineering.